Diving or snorkeling …. An unforgettable adventure! SAFE – SOUND – with Dutch instructors. Dive2gether is a Dutch diving school in Plakias. The family business is known for its quality and comfort. 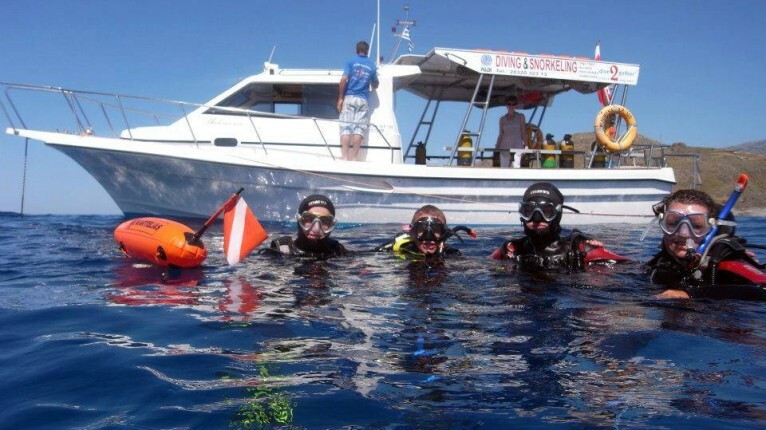 For over 10 years, the Koblens family and their enthusiastic team of professional dive guides and instructors offer diverse activities that will make your vacation an unforgettable experience. 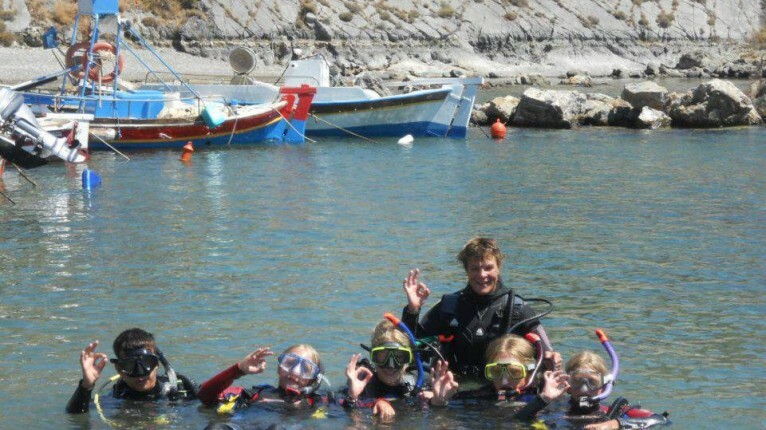 Plakias is a diving and snorkeling paradise! The sometimes strong north wind that comes from the gorges blows towards the sea and provides crystal clear water without waves. Novice divers as well as experienced diving enthusiasts can enjoy ideal diving conditions in Plakias. The underwater scenery is breathtaking! The steep rock formations and canyons that rise above water continue below the sea level. This provides divers with impressive views of colorful underwater life that finds shelter there. Experience it for yourself! Introductory dives – duration: 1 day –from 8 years old. You have never dived before but you would like to experience it? Hand in hand with your Dutch instructor you will learn in shallow water, the principles of diving. When you’re ready, he will take you on a tour through the colorful underwater world. – Children younger than 10 dive 1 on 1 with an instructor to a maximum depth of 2 meters. The fish and nature present here are a big surprise. – Adults and children over 10 dive to a maximum depth of 6 meters or where you feel comfortable. The truly adventurous have the option to dive deeper during repetitive dives under certain circumstances. Get your PADI diving certificate – Duration: 3 or 5 days – from 10 years old. As a result of a successful introductory Dive2gether offers the “PADI Scuba Diver” and “Open Water Diver” courses leading to an internationally recognized diving certificate. For certified divers, the dive center offers PADI courses and follows a daily program of guided “fun dives”. Accompanied by an experienced diver/guide you can make two dives per day from the beach or from ‘Philomena’, the luxury cruiser. The groups consists of a maximum of 6 divers with similar diving experience. Snorkel Trip to the Waterfalls – for all ages! 1 time per week we organize a diving adventure trip for divers and non-divers. In the mountains behind Plakias the springs of the river Kourtaliotis form waterfalls. With a diving suit,a mask and a snorkel you swim along small and large waterfalls. The otherwise barren rocks are completely covered with beautiful plants and flowers. For those who love nature and water this is a great experience. Learning Snorkeling – duration: ½ day – from 6 years old. For those who do not want to dive, snorkeling is a great alternative. In half a day a Dutch instructor will teach you how to safely and comfortably move through the water. The wetsuit will keep you warm and safe, floating on the surface as you can see for yourself. With a mask and a snorkel from the surface you can have a glimpse of the underwater world. A new world opens up to you! After the training, you can choose to go on the boat to snorkel independently to magnificent dive sites for a day. You can also rent snorkeling equipment from the beach and practice independently.